Last week I said I'd post a few Sepia Scenes thumbnails of people's posts from last week. And here they are! 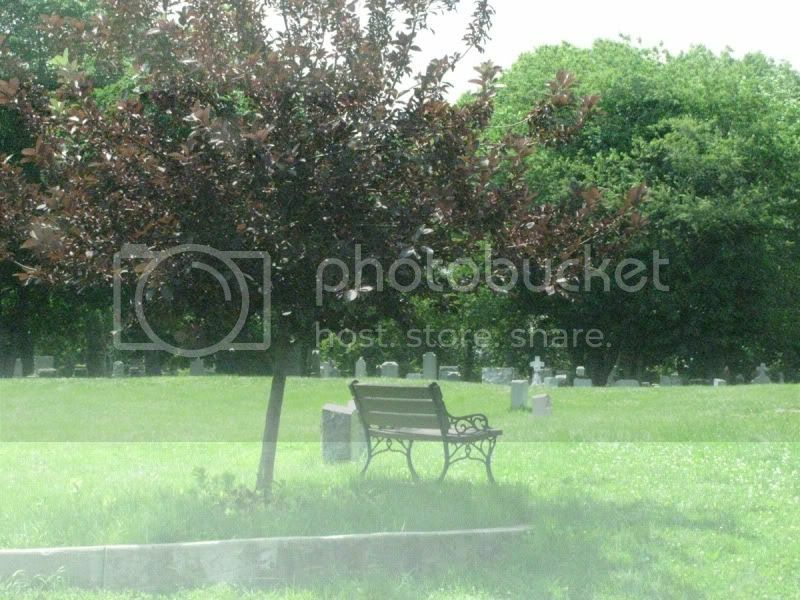 A lone bench to sit on and contemplate in St. Michael's Cemetery in Astoria, Queens. Something happens to the blur in sepia. Well, it's time to sign Mr. Linky and leave a comment. 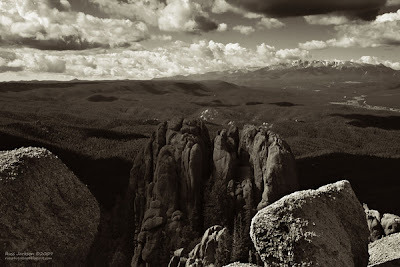 Don't forget to visit other people and enjoy their Sepia post. And don't forget to look for your thumbnail next week! These are all phenomenal, but I think the Canada Day shot is my favorite. The spot color really jumps out. Was this cross-posted to Ruby Tuesday? It should be! What a nice surprise, Mary, seeing my car up there. Thanks! I love the sepia bench. Taken out of a car window may have given it a bit of a blur but that blur works well with sepia and lends it a very ghostly feeling. I love the idea of posting your favorites from the previous week, Mary. Your Sepia Scenes participants have such talent. I can't see your photobucket pics right now - I'll come back later to see if they show up on my computer. Since Annie commented on them, I'm guessing it must be my computer. 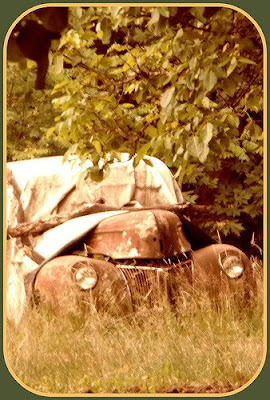 This week, Daphne is strutting her stuff old-school in an antiqued photo at Purrchance To Dream, and I have two pics of one of my favorite places on earth up at It's A Blog Eat Blog World. P/S: Sorry, entering my link 30mins earlier than my post. I'm really too sleepy now. I watch MJ Memorial till 4am this morning. So sorry. Love what sepia did to your somewhat blur picture. It has an air of fairytale, like Tinkerbell might show up any minute. I'm also amazed about what Annie does to her pictures, giving them so may shades and colors, still sticking to the sepia theme. The little birdie baby and the Marigold made me hold my breath of fear to disturb such a precious moment. Thought I'd join this week. 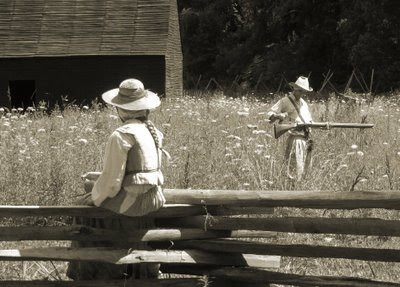 I like how the photo turned out in sepia. The blurriness adds that vintage feel to the photo. And getting glimpses of some of the previous entries was nice too. 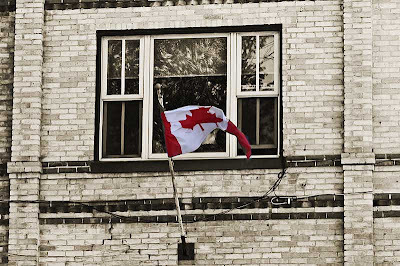 Thanks for including my Canada Day Sepia Scene. You have a way of making me feel good! Great idea to post your favorites from last week! Oh, that's awesome. The blur is so effective in sepia. The sepia bench is very atmospheric ~ dreamy and romantic with a hint of solitude! Beautiful! I like the atmosphere that the sepia tone creates around the lone bench. Cool capture from the car, Mary! That's neat that you included Ralph's photo from last week. He has some great family pix. A lonely bench always makes me want to sit and ponder. Thanks for adding my swallow in the thumbnail, I'm honoured! I'm doing a little demonstration this week, I have found a new toy! I really do love the bench! What wonderful captures, each one! Thanks for posting them. 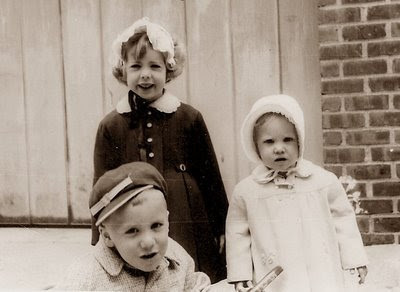 I have found that Sepia covers all kinds of boo boo's. Mine is posted at my place, A View of my Life. Have a great day!! 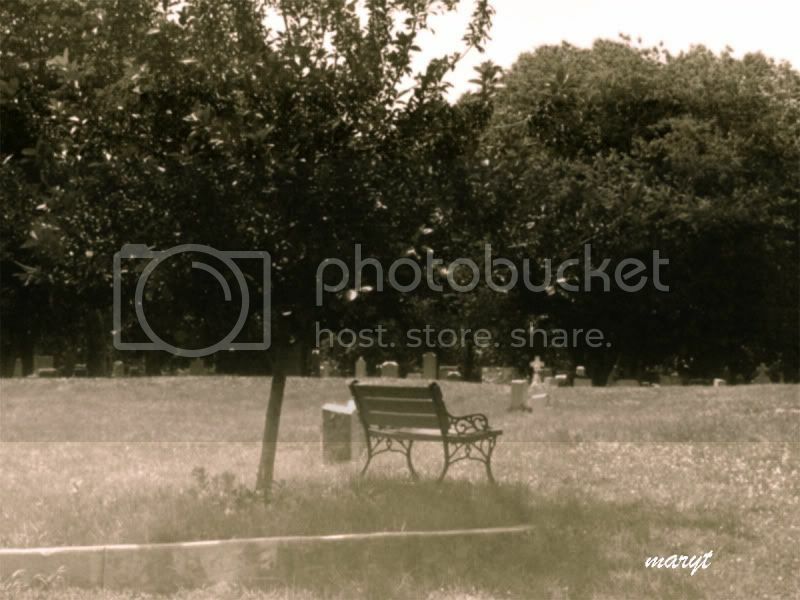 The sepia bench and graves are romantic and pensive. You're so creative. I have had a lot of troubles to open this page. Maybe Explorer 8 cannot open so now I took my other pc and succeded so I'm happy to give my link for the first time. I will gladly join the Sepia Scenes. 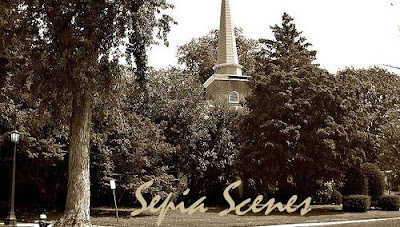 After having been inspired by others and you use the Sepia tone in their image, I want to also be included and play in Your "Seoia Scenes. Come in and look at my first contribution. I also like the fogginess as it does indeed increase the vintage feel of the photo.